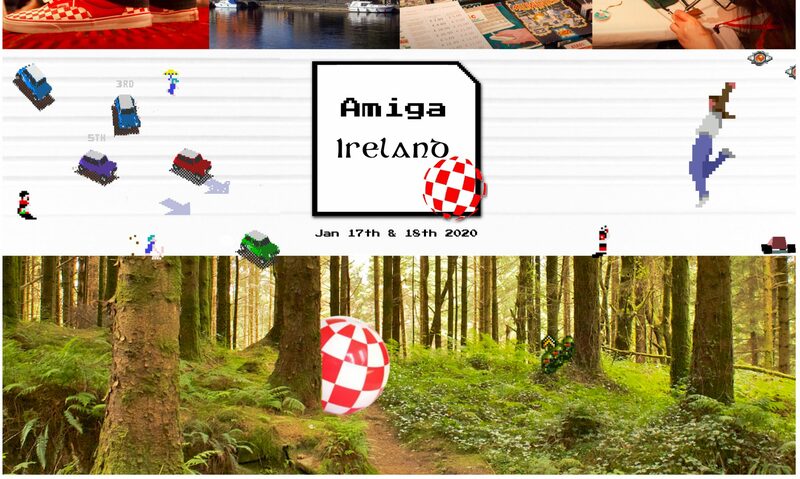 This was our third Amiga Ireland event since we (re)started in 2016 and it’s the first time we became a two-day rather than just a one day event. It’s risky running an event like this because you need to spend a certain amount before the bookings come in. This year we had sponsorship which made it much easier on the nerves! A massive thank you to our generous sponsors A-EON, AmigaKit, The Computer & Communications Museum of Ireland and Optimum Health Trainings. All of them were were represented at the event. With some help from Kenny, Liam, Craig & Co. we got the room set up and decorated. Freshly printed badges were unpacked for our sixty ticket holders and the doors opened at 1pm on Friday. Aisling attended the door for the two days despite having a flu, thanks so much for showing up and sticking it out. Also thanks to John Mullins for getting her medicine from the pharmacy. Such a kind gesture that sums up the kind of people that come to Amiga Ireland. Ticket sales have increased steadily every year. Very quickly people from previous years were reunited and new people put faces to names. Machines included several CD32s, A500s, A1200s, A4000 and an AmigaOne X5000 and A1222 (brought by A-EON/AmigaKit). Various Raspberry Pi based solutions were also on display including AmigaForever. There were also two C64s and a VIC-20. A Commodore PET was due to be on display but it’s courier (who was to attend the event) ran into difficulty – hope you can make it year. There were plenty of expansions and modifications to see too like WiFi on Amiga and C64, A1200 Bitfrost, Dropbox on Amiga, Music-X with MIDI keyboard connection and sound bank (more on that later). A core AROS developer Neil Cafferkey was there with a complete AROS installation to take any questions. Johnny Acevedo of AmitenTV sent us a copy of Dreams of Rowan to play on the day. Thanks Johnny! And of course, plenty of games running as well as game competitions for Sensible World of Soccer, Stunt Car Racer, Paper Plane and Crazy Priest. Crazy Priest received a lot of praise from people at the event. I found out later that Antonio Vargas-Gonzales was a member of demo groups such as Batman Group. His passion is a little contagious 🙂 I also had a really in depth chat with Ms Mad Lemon about everything from Amiga to life in general. It was a little surreal to speak to her in person and see her signature Amiga mods and floppies on the desk. Seamus Doyle was there on a ticket that was bought for him as a birthday present. In fact he was part of a group of three great guys from England, on of whom won a TerribleFire accellerator assembled by Stephen Leary himself! The KA Plus Magazine team arrived with discounted magazines and free posters. Tomasz also did a very slick presentation on the magazine followed by a Q&A. The magazines sold out at the event 🙂 There was a lot of good humour and joking that can’t (or shouldn’t!) be translated to text! Out of the blue, Cloanto representative Joe Pillow arrived and offered a free download of Amiga Forever for everyone in attendance. It was very unexpected and appreciated, thank you! Donations like this are usually unexpected but this year spot prizes were donated including Amiga WiFi and ethernet networking cards sent to Ireland by Lukasz Kucharuk. Mattie Whittle donated some boxed titles including Star Trek the Motion Picture, Deluxe Paint III, Pen Pal and more. Eddy Carroll donated some rare Amiga and C64 books, an original and as-new Almathera Photogenics T-Shirt as well as three Amulet Voice Remote Controls to try on a modern Amiga. Craig Harrison donated a brand new copy of Enemy 2 for Amiga. Daniel Cyganek donated new cassettes for C64, beatifully printed floppy images of Paper Plane. He also 3D printed some amazing Amiga Ireland keyrings as well as the Paper Plane trophy. Eric from AmigaLove.com donated some beautiful stickers all the way from Seattle. Some Commodore and Amiga badges were also added to the mix.Quite a few people including Daniel, Craig and others brought extra equipment to make sure nobody was stuck on the day and that’s always very much appreciated. Gaming warmups continued before the competitions began and at 5pm the Amiga Ireland Podcast began a live show. At this stage, there was a lot of chatter and laughter in the room as well as excitement over game matches that were too close to call. It was time to go for our meal and there were forty people in the room at this stage. Due to traffic, David Pleasance, Trevor Dickinson and Matthew Leaman met us at the restaurant instead of the venue and arrived to a round of applause. Eddy Carroll and Niall Ó’Brolchain arrived at that time too and we learned that this was the first time they had seen each other in over thirty years. When we got back at 7pm, we chatted with David and Trevor about their plans and they both hinted at an announcement that would be made the following day. There was some Q&A and afterwards Allan Ullmann connected his CD32 to the projector and PA system. The rest of the night was about demos, games, good banter and drinks. We were scheduled to finish at midnight but the party continued until 1:30am. Next morning the doors opened at 9am and some music from AmigaRemixes.com were played while the workshops and interview with Paul Cuisset were being prepared. Rob Cranley of Amiga Future magazine did an amazing workshop. It was almost breathtaking to see him ambitiously take coders – including some first timers – from the basics of ‘what is code’ to developing a game. The results were very satisfying and it was as popular as his soldering workshop from the previous year. The Music-X workshop had a small gathering and demonstrated how Fairy Tale of New York was created on Amiga. Sound banks like the Roland units were common in the day but this workshop showed how to use Logic Pro as both a sound bank and an export device to get high quality results but still do 99% of the work on your Amiga. We hired a French translator for the interview with Paul Cuisset of Delphine, known for Flashback among other things. The Amiga was before his time but he had a few games of paper plane while we waited for Paul to come online. Unfortunately, Paul never materialised. We haven’t heard from him since before the event and hope he is okay. If there’s a chance to do it again we might put a video online. Next was the Commodore Creative Competition. We announced this only a few weeks before the event. It was better for us to keep the number of entries low for our first time until we get the hang of it. The only criteria was that it had to be a creative submission with a Commodore or Amiga theme. The promotional piece that was released encouraged people to think outside the box and submit anything from origami, knitting, edibles as well as classic entries like MODs, demos, games and art work. We recieved six entries by the closing date. Runners up included a re-imagined Commodore logo by Karl, a demo by Andrzej Wilk aka Motion of ARTSTATE/DENSITY DESIGN and a game made on RedPill by Juan Jose. You can download these entries at these links. Daniel Cyganek created 3D printed molds for her to get the paint job just right (after some failed attempts to do it manually – thanks Daniel!). Ana has been spotting boing balls since she met Trevor at Amiga Ireland last year. The best one was this structure outside an airport in Thailand that made it’s way to Trevor’s Amiga blog post. This didn’t just look amazing(!) but tasted really nice too and I could tell her dad was very proud of her excellent work. The consensus is that the right choice was made for first place. Our judges were Trevor Dickinson, David Pleasance, Alanna Kelly (@sparklyparticle) and Ms Mad Lemon (@MsMadLemon). They were instructed to mark each entry on four different criteria; technical merit, artistic merit, quirkiness/originality and a fourth category purely for the judges discretion. The scoring was kept private and only the final total was announced. Thanks to our judges for taking part and thanks to all for submitting something, it was exciting and while we didn’t separate entries into categories this year we think at least any entry had a chance of winning regardless of it’s type. After this we had a short video demonstration of FriendUP followed by another sent by Stephen Leary AKA Terrible Fire. Stephen was due to be here but ended up flying airplanes in another country – as you do Steve! Stephen very kindly donated a fully assembled accelerator and asked three questions which people had to answer on paper. The questions were based around motherboard names from certain models of Amiga. The winner was Simon Varghese (I hope I have the right Varghese!). We had so many donations of spot prizes this year that everyone got something! I spied a lovely Comic Setter manual in the mix too. We had Amiga Ireland mugs on display which sold out. Recording a chat between @david_pleasance and Trevor Dickinson at the @AmigaIreland meetup in Athlone! Great stories between them. On Saturday evening everyone packed up and those of us who didn’t need to leave in a hurry went on to Gerty Browns pub. They place is very old and charming. It was great to get time to talk to people more in depth, although it’s hard to get to everyone. There was a lot of laughter there for most of the night because .. well … what happens in Gerty Browns stays in Gerty Browns! Prize & Gift Donations – Cloanto, Stephen Leary (Terrible Fire), Eddy Carroll, Mattie Whittle, Daniel Cyganek, Craig Harrison, Sir Lucas of AmiBay, www.amigalove.com for the stickers! For more insider info on the event see SensibleBloggers post here or Ms Mad Lemon’s excellent video below!